Avoid large fines by being Do Not Call compliant. Let Do Not Call List Registry Check help you! Download Do Not Call List Registry Check Lite For Free! Single phone number searches will always remain free. Your download also includes a trial of list-scrubbing features. What is the Do Not Call List? On September 1, 2003, the Federal Trade Commission (FTC) put online a national list of consumers' phone numbers who wished to not be called by telemarketers. Starting October 1, 2003, the FTC, the Federal Communications Commission (FCC) and local agencies began to enforce compliance with the list. The provision mandates that no telemarketer may call a phone number on the list, with exception to political organizations, charities, telephone surveyors, or companies with which a consumer has an existing business relationship. Violations can be costly: up to $40,654 per violation! The Do Not Call List Registry Check can help prevent such expensive violations from occurring. You can learn more about the Do Not Call List on our Frequently Asked Questions About The Do Not Call List section. Additional information is available at the Federal Trade Commission's DNC website. Who is Do Not Call List Registry Check Designed For? This product is designed for any business that solicits over the phone (also known as "cold calling" and "warm calling"). When ever an associate makes a call to someone on the Do Not Call List (bar those who are current customers [last 18 months]), they are causing your business to break the law. Violating the Do Not Call law can results in fines of up to $40,654 per violation. This list is by no means conclusive. If your business markets over the telephone then you need to be aware of the Do Not Call List and you need to adjust your company's marketing processes and policies to help prevent violations. Do Not Call List Registry Check can play a major role in those changes. In the year since the anti-telemarketing registry was officially launched, more than 62 million telephone numbers have been posted to the list, according to the Federal Trade Commission....428,000 complaints had been filed against more than 130,000 companies said to have made telemarketing calls to numbers on the Do Not Call list. About 200 companies are repeat offenders with 100 or more complaints each. Using the Do Not Call List Registry Check is quick and easy. Just tell the application where the lists are and you're done. Anyone who has manually searched for phone numbers on the Do Not Call List knows how frustrating it can be; it contains millions upon millions of numbers spanning multiple lists. Now it's easy as pressing one button! Do Not Call List Registry Check can cross reference your company's internal Do Not Call list as well as Federal and State Do Not Call Lists. All of this is transparent to you; the application scans all Do Not Call lists at the same time and simply lets you know if a phone number is on any Do Not Call list. Much care was taken during the development phase of this project to make this application as easy as use as possible. After all, time is money. We've automated just about everything. All you have to provide are the Do Not Call list(s), telephone numbers to be searched, and any contact lists you may want scanned for Do Not Call numbers. The program takes care of the rest by telling you who you can call and who you cannot call. Whether your company makes hundreds of calls or only a couple of calls per day, one thing is for sure; you don't want yet another program distracting you while talking to your customer. Fortunately Do Not Call List Registry Check is very small; it fits on top of the standard toolbar for most applications such as spreadsheets, word processors, etc. That means you can simply dock Do Not Call List Registry Check on top of another application's toolbar, allowing you to keep 100% screen real estate for that application. Furthermore, you can (optionally) have the DNC Registry Check window always on top. This allows you to not have to constantly switch between windows; keeping you less distracted while you talk to your customer. Do Not Call List Registry Check is extremely flexible; it allows you to search American federal and state Do Not Call lists, Canadian Do Not Call lists, and even custom Do Not Call lists all at the same time. The scrubbing function of the Do Not Call List Registry Check is powerful and flexible. The application can scan Comma Separated Values (csv) files, Excel spreadsheets (xls), Excel 2007+ spreadsheets (xlsx) and Microsoft Access Database (mdb), and Access 2007+ (accdb) files. The scrub tool can handle files that store phone numbers in any form (e.g. 123-456-7890, (123) 456-7890, etc). It can also handle phone numbers that have an area code in a separate column. The application even allows you to specify a default area code for phone numbers that do not have one specified. This feature is only available in the Full Edition. Do Not Call List Registry Check helps you stay compliant by providing reports on who imported Do Not Call lists and when they were imported. We also track all list scrubs. Why Upgrade to Do Not Call List Full Edition? If your company only needs to perform single phone number look-ups against the Do Not Call Registry, then Do Not Call List Registry Check Lite can fulfill your needs for free. However, if you need a more powerful feature set such as list scrubbing, then Do Not Call List Full Edition is the product for you. We offer a fast and easy solution out of the box and without a subscription for a fraction of the cost of competing products. 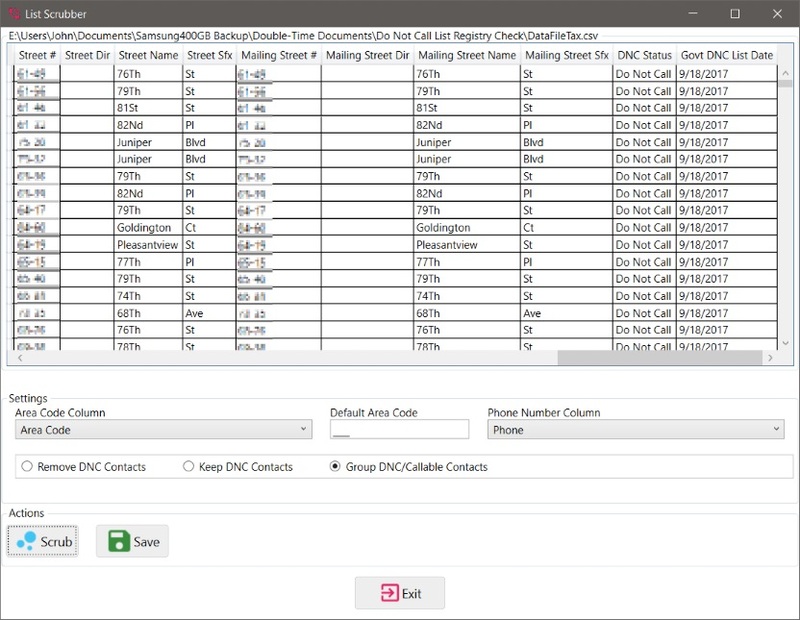 You can evaluate some of the features found in the full edition for 30 days after installing Do Not Call List Registry Check Lite, after which only the Lite features will be accessible.